Benno Rosenmeier, owner of Stald RH in Denmark, has experienced great benefits from using Wiking® Manila Fibres for his indoor riding arena. Benefits include improved shock absorbing qualities and a reduction of horse injuries. To improve the qualities of his riding arena, Benno Rosenmeier has spread Wiking® Manila Fibres over the floor and harrowed the fibres down into the clay-like subsoil. As a result, the quality of the footing has improved greatly – to the advantage of both riders and horses. According to Benno Rosenmeier and the experienced riders that use his arena, the quality of the footing has risen to a level, which is normally only found in arenas, valued at £ 100,000 or more. Hence, for a fraction of the normal price, Benno Rosenmeier has gained the highest level of quality in footing with Wiking® Manila. The fibres also have a sound-dampening effect, which makes training sessions less exhausting for both horses and riders. It has yet to be measured, but Benno Rosenmeier also believes that the improved footing material has reduced the number of horse injuries: “When the footing is bouncy, strides in the arena, will put less strain on the equine musculoskeletal system of the horses.” Benno Rosenmeier further explains this with the example of runners who use shock-absorbing trainers instead of running barefoot. For riding arenas exposed to frost, Wiking® Manila Fibres may extend the season by up to two months. If fibres are added to the footing, frost has to be severe before the footing material loses its softness and flexibility; not least relevant if step machines are used to train the muscles of horses. 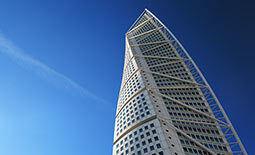 We are the proud supplier of construction fibres for the award-winning skyscraper Turning Torso in Malmö, Sweden. Stald RH has experienced great benefits from using Wiking® Manila Fibres for the indoor riding arena. A wide range of polypropylene fibres, especially developed to enhance the performance of filtration, paper, soil, flocking and much more.